Android Scan has been renamed to CompareEverywhere for the second half of the Android Developer Challenge. A few months ago I had a great opportunity to share my application as part of an Android Developer Profile. Android Scan is one of the 50 winners of the Android Developer Challenge, more details to be released on Monday. I'll also be at Google I/O later this month. How do I use Scan? Well, it's pretty simple really, just point your phone at a barcode and scan it. You'll probably need to get pretty close to the barcode. 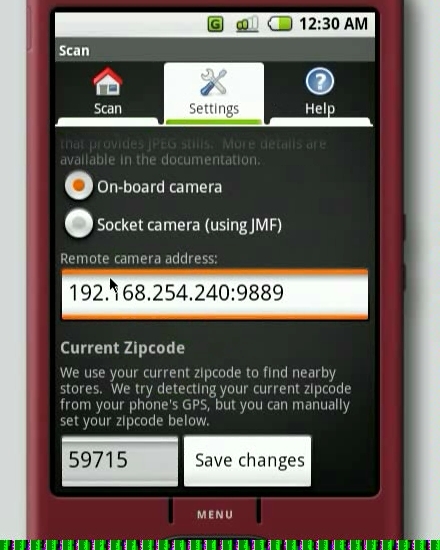 Try filling the camera window with the barcode, and make sure you have good light. If you're running on the emulator, check out the section below for instructions on hooking up a webcam. Once you hit "Scan" the Android will try recognizing the barcode, and will then ask a remote server to gather up metadata and prices about the item you scanned. This will usually take about 15 seconds. When it returns, you'll be shown some metadata about the item you scanned, mostly for you to verify that we found the correct item online. You'll see reviews from Amazon.com that you can scroll through and read. On the "Sellers" tab, you can browse a list of sellers who have the item you scanned. These can range from online stores like Half.com, to a brick+mortar Barnes and Noble down the street, to your local library if they have a copy. Scroll through the list using the arrow keys to pick a store, then tap on "Link" to jump to their website. If it's a brick+mortar store, "Directions" will show driving directions from your current GPS location and "Call" will call the store's local phone number. 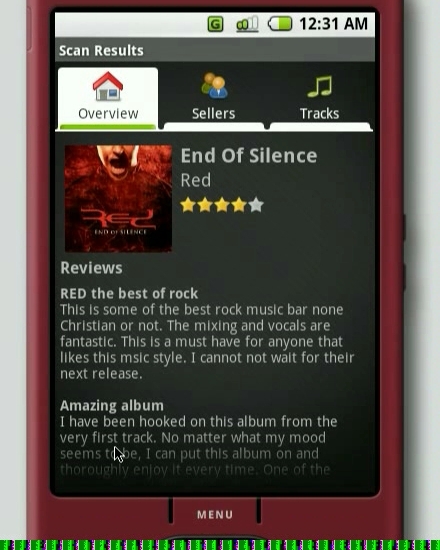 The seller list is sorted by price, allowing you to quickly get a gauge of what the item is selling for. If you scanned a CD album, you'll probably see a "Tracks" tab that lists all of the album's tracks and their play length. If the album is available in the Amazon MP3 store, you'll see a "Play" button which will stream and play a 30-second sample clip of the track right on your phone. That's the basics of what Scan does. The power lies in the Python backend that does the heavy lifting of searching stores for you. It runs on a remote server to keep phone bandwidth low. You can read more about the server script in a separate section below. So are you stuck with an emulator instead of a real Android phone? 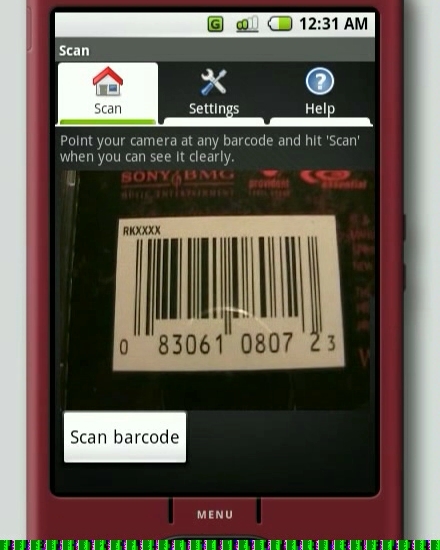 You can still get a camera working to scan barcodes, just like we showed in the video. I'm using the approach pioneered by Tom Gibara with his remote camera idea. Essentially you're using the Java Media Framework to latch onto your computer's USB webcam and create a network camera that the Android can hook into and use. Then connect to the running JMF program from Scan by changing the camera source to "Socket camera (using JMF)" and entering your local IP address. Be sure to use your computer's real IP address, as 127.0.0.1 has a special meaning to the Android emulator. Then click "Save changes" and switch back to the "Scan" tab. You should now see your webcam live on the Android device. Move around, zoom in on a barcode, and click "Scan" just like you would with a real phone device. You might have trouble with cheap webcams because the optics aren't detailed enough for Scan to recognize the barcode. If you keep getting barcode recognition errors, try again with a better webcam, or using better lighting. The Python script will mark any nearby stores or libraries with an address and phone number. For metadata, the script fills in details from any available data source, which means it can still provide answers even if one or more APIs fail. How is Scan able to play sample music clips? 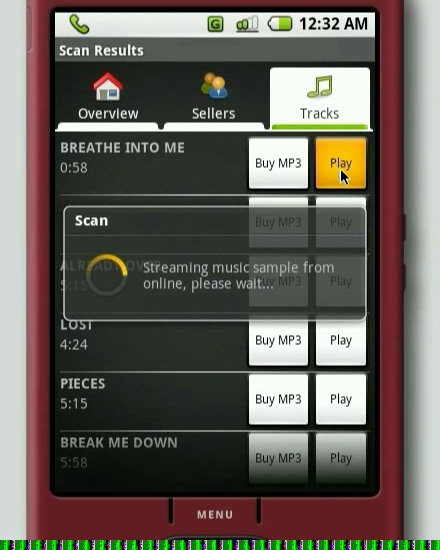 Scan can play back sample music clips for any album available in the Amazon MP3 store. This feature isn't even provided by Amazon at this point, so we have some pretty sweet screen-scraping going on in the Python backend that digs deep into Amazon to pull out sample clips that can be played easily on the phone. All materials on this website are copyleft.